We are a Masters Swimming Club based in Dartmouth, NS, Canada. 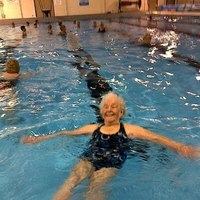 Our membership consists of around 65 adults of all ages and all levels of swimming. We traditionally practice three times a week at the Dartmouth Sportsplex but for the 2017-18 year we will be at Centennial Pool from September until June. All of our practices are led by our fabulous Coaches. For inquiries, please Contact Us!